Free festivals are a combination of music, arts and cultural activities, for which often no admission is charged, but involvement is preferred. 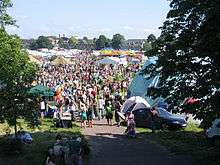 They are identifiable by being multi-day events connected by a camping community without centralised control. 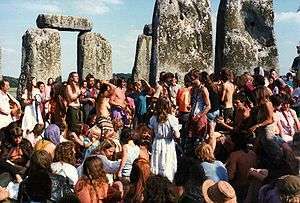 The pioneering free festival movement started in the UK in the 1970s. 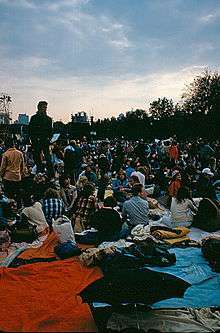 The first intentionally free festival was the 1972 to 1974 Windsor Free Festival, held in Windsor Great Park, England. The 'organisation' was mostly Ubi Dwyer distributing thousands of leaflets and asking people and bands to bring their own equipment and create their own environment - "bring what you expect to find." "Free festivals are practical demonstrations of what society could be like all the time: miniature utopias of joy and communal awareness rising for a few days from a grey morass of mundane, inhibited, paranoid and repressive everyday existence…The most lively [young people] escape geographically and physically to the ‘Never Never Land’ of a free festival where they become citizens, indeed rulers, in a new reality." Un-authored leaflet from 1980, quoted in George McKay’s Senseless Acts of Beauty: Cultures of Resistance Since the Sixties (p. 15). In recent years, teknivals are a type of free festival, as are many technoparades. ↑ Clarke, M. (1982). The Politics of Pop Festivals. London: Junction Books. ↑ McKay, G. (1996). Senseless Acts of Beauty: Cultures of Resistance Since the Sixties. London: Verso Books. Wikimedia Commons has media related to Free festivals.